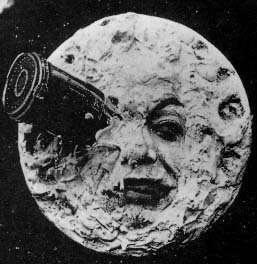 In case it isn’t obvious from my screening log, I’ve been going through a Georges Melies DVD lately, and never in anything less than awe at what he could do. No discredit to Edison and his team or the Lumieres, but they were inventors primarily. ARRIVAL OF A TRAIN, e.g., exists today solely for (obviously enormous) historical interest. Melies, a former magician, was the first man to use this contraption for entertainment or artistic purposes (though he did have antecedents in magic-lantern shows; he obviously brought a great deal from then-current theater and magic shows; plus, he ripped off the Smashing Pumpkins). To say that “the movies” descend from Melies, in the sense of the entertainment medium that we mostly mean when we use that term “the movies” … that would obviously oversimplify. But as oversimplifications go, it’s true enough. Here’s an example of his work, THE MAN WITH A RUBBER HEAD, one of my favorites from DVD. I don’t think I’m the easily-dazzled type (special-effect-o-ramas generally bore me silly), but I don’t see how one’s mouth can’t be agape at that film, and Melies’s others (many, including A TRIP TO THE MOON, available at YouTube). Not because I’ve never seen that trick or don’t know it can be done better today; there’s no question, this is a very simple, primitive movie that doesn’t last as long as a Saturday Night Live sketch, though its comic timing and “sell” is as brilliant as gag-writing gets. But you can hardly watch that and believe … that this was made in 1901. That’s twice as close to Edison’s sneeze (1894) as it is to Griffith’s BIRTH OF A NATION (1915 … by which time, BTW, Melies’s career was basically over). That’s as close to the end of the French Revolution as it is to today. I do try generally to watch and judge movies in a decontextualized way (I have TRIUMPH OF THE WILL and EARTH on top of two of my 1930s Top 10s, after all). I try to avoid “grade on a curve” for time, but in this case I cannot. Melies doesn’t allow you to do that, simply because his films so specifically date themselves. For example, look at the “acting,” of Melies himself, in that film I linked to. But at the same time, he shows special effects that seem so FAR ahead of their time that they still work today. Some are even in [gulp] … color … like THE INFERNAL CAULDRON. 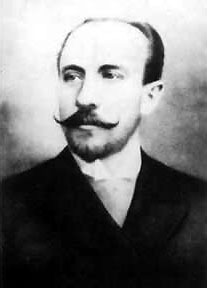 Melies also had more of an aesthetic sense than any filmmaker in 1900 had a right to — his camera never moved, partly from necessity, but also because he intuitively picked up that he was putting on a magic show and so the spectator should stay glued in his seat. His set designs were busy, baroque fantasies, painted backdrops of unreality 15 years ahead of CALIGARI and contemporary with HG Wells. Anyone with an interest in scifi or fantasy movies owes it to himself to see where it all began. But even for me (not generally a genre hound), his films do the most basic thing a film can do — dazzle and amaze. Even when we see through it … it’s as if … you don’t really want to work it out. You want to be fooled.